How sweet it is: Dustin Hermanson was an addict. Not to narcotics or steroids, and he wasn't an alcoholic. 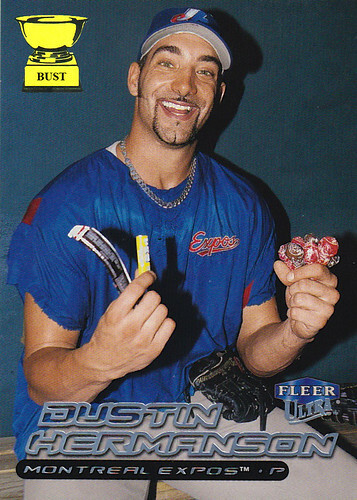 No, Dustin Hermanson was addicted to sugar. Before taking the mound early in his career as a starter, he would choke down seven Almond Joys, four Tootsie Pops, a 12-pack of Mountain Dew and as many Pixie Stix as he could fit in his mouth. Hermanson would flirt with triple digits on the radar gun, but by the end of the fourth inning, a sugar crash would start to set in. Batters would begin reaching base, and before long, Hermanson would lay down on the infield grass with a gut ache, holding his stomach and occasionally dozing off. Eventually, Hermanson was named his team's closer, as well as Delta Dental's customer of the month. Greaseball alert: The neatly trimmed hair on and around his face. The unnecessarily heavy jewelry. The veiny arms. If this card had a title, it would be "Jersey Shore Goes Trick-or-Treating."